Journal Reference: Osman M, D Turner, T Heus, and R Newsom. 2018. "Characteristics of Water Vapor Turbulence Profiles in Convective Boundary Layers During the Dry and Wet Seasons over Darwin." Journal of Geophysical Research: Atmospheres, 123(10), 10.1029/2017JD028060. 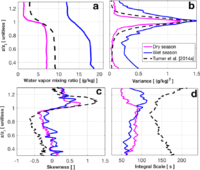 Median profiles of (a) atmospheric water vapor variance and (b) the coefficient of the structure function derived from the wet season (blue) and dry season (magenta) cases. The latter was computed simultaneously with the atmospheric variance by fitting the structure function. The structure function is related to the turbulent dissipation rate, making it an important measurement. Comparisons of the median vertical profiles derived from the Darwin and SGP sites. 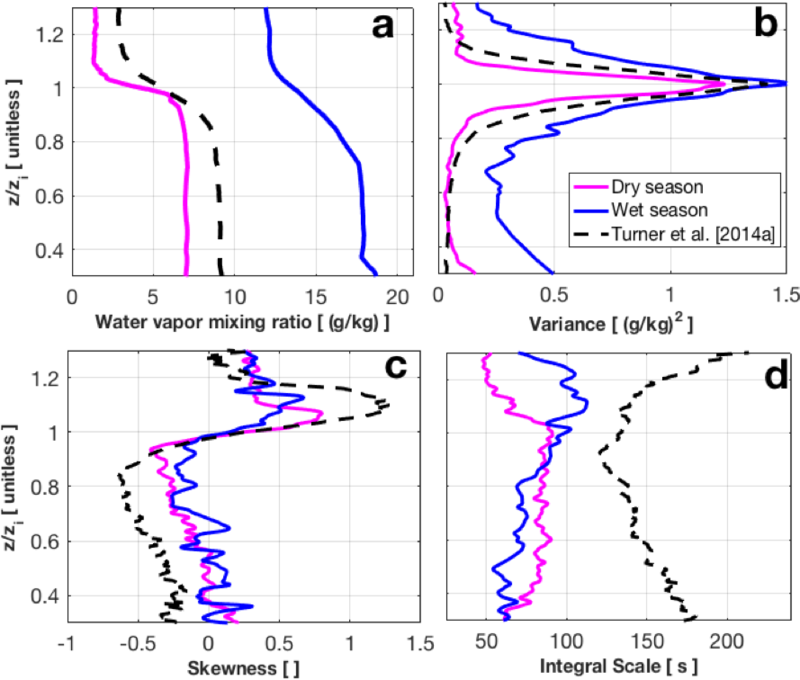 Median profiles of (a) water vapor mixing ratio, (b) atmospheric water vapor variance, (c) skewness, and (d) integral scale derived from the wet season (blue) and dry season (magenta) cases. Dashed dark lines are the median profiles at the SGP site taken from Turner et al. (2014). The median profiles from the SGP were computed from 300 cases, while the TWP used 8 and 37 cases for wet and dry seasons, respectively. Turbulence in the convective boundary layer (CBL) is often described by its statistical properties, including the vertical profiles of mean (first moment), variance (second moment), and skewness (third moment). Accurately representing turbulence in numerical models is critical because turbulence mixes mass, momentum, and energy within the CBL, and since turbulence works on a range of scales it must be parameterized in these models. Water vapor mixing ratio is a good atmospheric tracer gas as it is a conserved quantity under adiabatic conditions and in the absence of condensation and evaporation. The profile of water vapor variance is also an important parameter in many turbulence, convection, and cloud parameterizations. It increases with height, reaching its peak value at the top of the CBL due to the intensive mixing of moist air being lofted from the CBL into the free troposphere and the drier air descending from the free troposphere into the CBL. Furthermore, the profile of water vapor skewness offers insight into the vertical transport of water vapor through the top of the CBL. Hence, proper representation of these turbulent processes in models is needed to improve both climate simulations and weather forecasts. This study examines profiles of water vapor turbulence during which the CBL is cloud-free, quasi-stationary, and well mixed over a 2-hr period using the Raman lidar observations from the Atmospheric Radiation Measurement (ARM) Tropical Western Pacific (TWP) site located at Darwin, Australia. We identified 45 afternoon cases, consisting of 8 wet and 37 dry seasons events, over the 5-year data record. Wet and dry season cases were treated separately to derive the median second- and third-order moments along with the integral scale and coefficient of the structure function. We found striking differences in these variables among the tropical wet season, dry season, and midlatitude cases. Midlatitude data sets were obtained from similar observations from the Raman lidar at the ARM Southern Great Plains (SGP) site. The wet season shows larger median variance profiles than the dry season, while the median profile of the variance from the dry season and the SGP site are found to be more comparable. Such continuous, long-term, high temporal and vertical resolution observations of water vapor are valuable to evaluate the performance of turbulence parameterization schemes in models in the CBL, which are essential for improved weather forecasts, regional climate projections, the dispersion of health-hazardous air pollutants and greenhouse gases, and simulating convection initiation and the formation of clouds and precipitation.